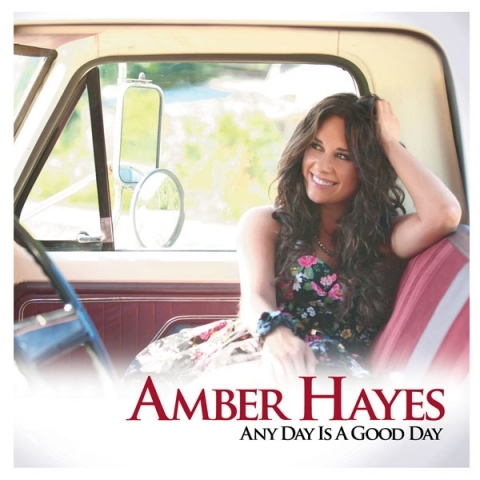 (Nashville, Tenn. – Oct. 24, 2012) Any Day Is A Good Day, the anticipated sophomore release from Country artist Amber Hayes, is now available via iTunes, GMVNashville.com and AmberHayesMusic.com. Any Day Is A Good Day was produced by Nashville-based producer Paul Compton and reflects Hayes’ maturity as an artist and as a songwriter. Since releasing her C’mon EP in 2010, Hayes has toured the U.S. with former label mate Ty Herndon and traveled internationally in support of her music. Among her overseas dates have been shows in China, Japan, Sweden and Diego Garcia military base in the Indian Ocean, among others. Hayes has seen her music make the jump to both television and film in 2012. Three of her songs (including a duet with Lonestar’s Richie McDonald) appeared in the family film, “Cowgirls N’ Angels,” which ran in theaters this summer. The movie also marked Hayes’ acting debut in a major motion picture, though the singer has extensive theater experience. Hayes got her break in Nashville following her portrayal of Kathy Twitty in the 2008 musical, Conway Twitty: The Man, The Music, The Legend… The Musical. “Cowgirls N’ Angels” is currently available in stores on DVD. The CW television series “Hart of Dixie” also tapped Hayes for her songs in 2012, placing music in five of the show’s Season 1 episodes. Her 2010 single, “C’mon,” and her follow-up 2011 single, “Wait,” are among the four songs featured in the series this fall. For free downloads, contests and more information about Amber Hayes, visit http://www.AmberHayesMusic.com.